WASHINGTON: India continues to remain on the US' 'Priority Watch List' for alleged violations of intellectual property rights and for posing new challenges that have negatively affected American right holders over the past year, the USTR has said. In the report, the US said that these countries will be the subject of increased bilateral engagement with the USTR to address Intellectual Property (IP) concerns. "Over the past year, India took steps to address intellectual property challenges and promote IP protection and enforcement. However, many of the actions have not yet translated into concrete benefits for innovators and creators, and long-standing deficiencies persist. India remains one of the world's most challenging major economies with respect to protection and enforcement of IP," the report said on Thursday. Specifically, over the coming weeks, the USTR will review the developments against the benchmarks established in the Special 301 action plans for countries that have been on the 'Priority Watch List' for multiple years. For such countries that fail to address US' concerns, the USTR will take appropriate actions, such as enforcement actions under Section 301 of the Trade Act or pursuant to World Trade Organisation or other trade agreement dispute settlement procedures, necessary to combat unfair trade practices and to ensure that trading partners follow through with their international commitments, it said. In its India section of the report, the USTR said that long-standing IP challenges facing US businesses in India include those which make it difficult for innovators to receive and maintain patents in that country, particularly for pharmaceuticals, insufficient enforcement actions, copyright policies that do not properly incentivise the creation and commercialisation of content, and an outdated and insufficient trade secrets legal framework. In addition to these long-standing concerns, India also further restricted the transparency of information provided on state-issued pharmaceutical manufacturing licenses, and expanded the application of patentability exceptions to reject pharmaceutical patents, it alleged. India also missed an opportunity to establish an effective system for protecting against the unfair commercial use, as well as the unauthorised disclosure, of undisclosed test or other data generated to obtain marketing approval for certain agricultural chemical products, the report alleged. According to the USTR, last year it engaged with India to secure meaningful IP reforms on long-standing issues, including patentability criteria, criteria for compulsory licensing, and protection against unfair commercial use, as well as unauthorised disclosure, of test or other data generated to obtain marketing approval for pharmaceutical products. In a warning to India and various other countries, the USTR said that to maintain the integrity and predictability of IP systems, governments should use compulsory licenses only in extremely limited circumstances and after making every effort to obtain authorisation from the patent owner on reasonable commercial terms and conditions. "Such licenses should not be used as a tool to implement industrial policy, including providing advantages to domestic companies, or as undue leverage in pricing negotiations between governments and right holders," it said. As such, it is also critical that foreign governments ensure transparency and due process in any actions related to compulsory licenses, it said. The US will continue to monitor developments and to engage, as appropriate, with trading partners, including India, the report said. In India, rulings by government agencies are attempting to extend the scope of mandatory collective management of rights and statutory license fees for certain types of digital music services, it said. Also, the collection and distribution of royalties to US and other right holders should be carried out on a national treatment basis, it added. At the same time, the report also notes some of the best practices by India in the IP sector last year. For instance, India's Cell for Intellectual Property Rights Promotion and Management (CIPAM) organises and spearheads the government's efforts to simplify and streamline IP processes, increase IP awareness, promote commercialization, and enhance enforcement. The USTR said India has yet to take steps to address long-standing patent issues that affect innovative industries. Patent applicants face costly and time-consuming patent opposition hurdles, long timelines for receiving patents, and excessive reporting requirements, it said. In the pharmaceutical and agricultural chemical sectors, it said India continues to lack an effective system for protecting against the unfair commercial use, as well as the unauthorised disclosure, of undisclosed test or other data generated to obtain marketing approval for such products. It alleged that despite India's justifications of limiting IP protections as a way to promote access to technologies, New Delhi maintains extremely high customs duties directed to IP-intensive products, such as medical devices, pharmaceuticals, information communications technology products, solar energy equipment and capital goods. NEW DELHI: Goods and services tax (GST) on annual maintenance contracts (AMCs) is proving to be contentious issue for some of the white goods and electronics companies, which have decided to play it safe and charge higher rates, increasing the burden on consumers. A leading electronics goods company, for instance, is levying 28% GST, applicable on high-end gadgets, instead of 18% that applies to AMCs. There are others too who have decided against taking any chances. “Even though the intention behind availing maintenance of such products is uninterrupted service, in view of divergent rulings by AARs (Authority for Advance Rulings), some companies are charging higher rate (28%) even on annual maintenance services (18%) provided along with these products. This is resulting in unnecessary payment of higher price by the common man,” said Harpreet Singh, partner at consulting firm KPMG. The confusion stems from the classification as a ‘composite’ or a ‘mixed’ supply. A composite supply, such as a charger bundled with a mobile phone, will result in the tax on the primary item, handset in this case, even if the rate on charger may be higher. In contrast, in case of a mixed supply — such as a Diwali hamper containing fruits (zero duty), mithai (5%) and soft drinks (28% plus cess) — the highest rate will be applied on all items. 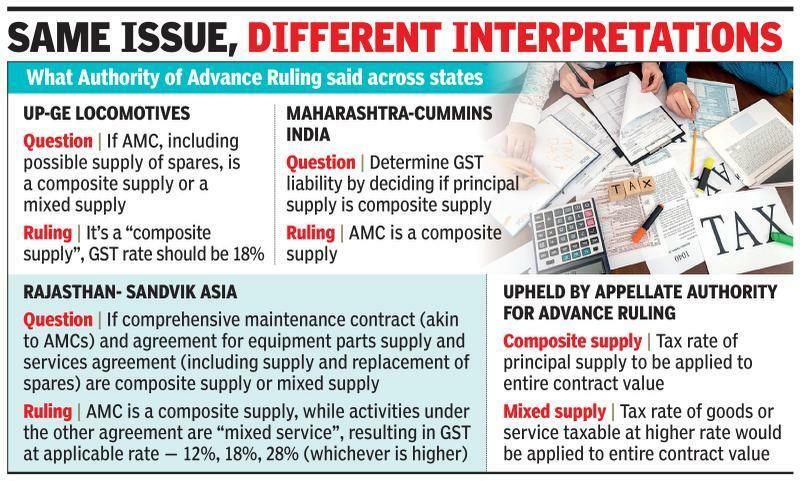 In most cases, AARs have held a basic AMC as a composite supply, which means 18% GST even if, say, a compressor that attracts a higher levy is replaced. But in some cases, such as the one involving multinational engineering group Sandvik’s equipment parts supply and services agreement, which includes supply and replacement of spare parts, the Rajasthan AAR and the Appellate Authority have classified it as a mixed supply, creating confusion for some companies and tax practitioners. Another tax consultant with a leading firm, however, said the issue has been sorted out as the principal supply in case of an AMC is a service. “It is more or less a settled issue,” the consultant said. The tax practitioner said there was some confusion in case of solar equipment too but that arose from attempts to put all goods and services in the concessional bracket of 5% GST. Commercial and public transport systems have “more compelling economics” of using electric vehicles (EVs) over private cars, given the low operating costs of these environment-friendly vehicles, a report by Ola Mobility Institute (OMI) Tuesday said. The report – based on insights from Ola’s EV project in Nagpur – also stated that it would make sense to focus on electrifying vehicles with the highest demand and utility in the Indian context i.e. two-wheelers and three-wheelers. “High upfront costs, lack of charging infrastructure and uncertain performance of a battery-powered vehicle may hold back rapid adoption of e-mobility for private users…(also) appropriate prioritisation of vehicle segments for electrification may prove to be critical to the adoption of e-mobility,” the report pointed out. It added that apart from incentivising purchase of EVs, “usage-based incentives” for electric vehicles will “accelerate innovation, encourage early adopters, enable new business models, and promote low-cost shared mobility services”. The report noted that the highest proportions of passenger-kilometres travelled are by public and shared vehicles. Also, the largest fleets in the country are maintained by government agencies, civic bodies and app-based aggregators. “Hence, shared, public and commercial transport electric vehicles are better poised to bring down the total cost of ownership as opposed to an EV being used as a personal vehicle,” it explained. The report said the pilot had shown substantial potential for battery swapping as a reliable charging mechanism for small format vehicles. “During the Nagpur pilot, lithium-ion battery swapping increased the available operating time for three wheelers by 25 per cent compared to fixed battery systems, and by 50 per cent when compared to lead-acid battery powered alternatives,” it said. Additionally, the report also suggested usage of renewable energy to power EV infrastructure that also helps in reducing average electricity expense. “The Nagpur pilot was designed to provide first-hand experience to inform a viable business model for electric vehicles at scale. We are convinced that the growing base of renewable energy combined with sound policy measures to promote high utilization of electric vehicles can make India an exemplar for market-based electric vehicle ecosystem,” OMI Senior Vice President and Head Anand Shah said.